It’s no secret the economy has been in a terrible state. How and when will it turn around? What will the future look like? When considering these questions, and looking at today’s economic trials and how to get beyond them, it’s worth a look back at how we got here. It was a three decade journey representing three major transformational waves that have profoundly transformed our economy at the macro and local level. The 80’s were the culmination of the Rust Belt Era. The 90’s were the Digital and Nationalization Age. The 00’s were the Globalization Age. The 1980’s in a sense represented the end of the post-war story arc. It opened with Volker’s sky high interest rates that broke the back of inflation and ended with the fall of the Berlin Wall and the end of the Cold War. The 80’s started with an extremely deep, manufacturing-centric recession. While the metals industries and some others had struggled in the 70’s, along with pretty much the rest of the US economy, the rest of the manufacturing sector, ranging from autos to electronics underwent its most wrenching period of transformation. This saw the first major offshoring waves, as a large number of plants were moved to Mexico (or the Sun Belt). This legacy sill permeates the consciousness of the Rust Belt today, and if you talk to a blue collar worker in those towns, you’ll likely hear NAFTA (a 90’s construct, but clearly the continuation of the 80’s Mexican manufacturing migration) blamed for America’s industrial woes. Also, the US saw the first tough foreign competition in these industries in the form of Japanese auto and consumer electronic imports. The cushy labor-management excess that characterized major American industry simply couldn’t hold up. I believe the early 80’s recession is what kicked off the large scale transformation of traditional American industry that is entering its final throes with the auto industry restructuring that is currently underway. When complete, the era of highly compensated industrial employment for low skill labor in the US will have largely come to an end. The 80’s also saw the incubation stages of trends that would shape future development, such as the introduction of the personal computer and deregulation, notably the AT&T breakup in 1984. The big trend kicked off by this was the increasing returns to college education. It was very clear even in the 80’s that if you wanted to attain a good standard of living and upward mobility, you should get yourself a college degree. It was a no-brainer. People with a high school diploma or less increasingly found themselves in a world of employment uncertainty, a financial freeze, and grim future prospects. This was stage one of the income gap problem. The technology revolution was in many ways the signature development of the 1990’s. I’m very familiar with this because I lived it. At the dawn of the 1990’s, corporate computing was dominated by traditional mainframes. While PC’s were in use in business, it was not unusual for white collar employees not to have a computer at their desk. Laptops did not exist, nor did cell phones to any practical extent. The internet was a very limited government and academic tool. By 2000’s, new technology had not just transformed corporate IT, it had transformed business. Cell phones, laptops, and internet access were ubiquitous in business. It is not surprising that this rapid change drove many economic changes. Firstly, the increasing centrality of technology to business led to an explosion in demand for technically competent people. This was the golden age for people working the technology and consulting industries. I’d suspect the technology consulting industry increased its employment at least five fold – all of it onshore. While traditional telecoms carriers shed thousands from their bloated workforces, startup telecoms hired in droves. This digitization wave reached its culmination of course in the dot com boom. It was a good time to be a tech guy, I can tell you. People would routinely get raises of 50-100% when changing jobs. Even people who didn’t leave saw huge market adjustments in their pay. Stock options made many people millionaires. But it wasn’t just techies. Adapting this technology to business required a huge amount of business skill and savvy as well. There’s enormous change required in business processes, people skills, and organizations. As an aside I would estimate that a typical business change project underpinned by technology only involves about 20-25% of the effort spent on the tech itself. All of this again produced enormous gains to people with college degrees. Companies such as my employer at the time were worried that the supply of college grads would simply be insufficient to keep up with projected growth. This reinforced the gap between college and high school educational attainment. This technology and other change (regulatory, demographic, etc) also unleashed the fragmentation of the great American common culture, and ultimately perhaps the American commonwealth itself. In the 1980’s we all watched three networks on broadcast TV. In the 1990’s it was “57 channels and nothing on.” We see this today in the ever increasing array of specialty and niche products. Terry Teachout is the best writer I know in discussing this fragmentation, and especially how it signaled the end of “middlebrow” in America, where the average middle class family consumed some culture that was, if not New York elite, at least intended to be edifying and enlightening. I grew up in the Age of the Middlebrow, that earnest, self-improving fellow who watched prime-time documentaries and read the Book of the Month…When I was a boy, most Americans who didn’t care for high art still held it in a kind of puzzled respect. I doubt that Ed Sullivan cared much for Maria Callas or Edward Villella, but that didn’t stop him from putting them on his show, along with Louis Armstrong and the original cast of West Side Story…Just as city dwellers can’t understand what it meant for the residents of a rural town to wake up one day and find themselves within driving distance of a Wal-Mart, so are they incapable of properly appreciating the true significance of middlebrow culture. For all its flaws, it nurtured at least two generations’ worth of Americans who, like me, went on to become full-fledged highbrows…What’s really sad is that most people under the age of 35 or so don’t remember and can’t imagine a time when there were magazines that “everybody” read and TV shows that “everybody” watched, much less that those magazines and shows went out of their way to introduce their audiences to high art of various kinds. Prior to the 90’s, when there were only three networks, where there were limited choices in arenas of all types, they had to appeal to a broad America. This a) forced people to consume them because they had no other choice and b) made those who produced them feel at least semi-compelled to produce at least some socially edifying and enlightening content. It goes beyond Teachout’s exposure to some high art. Think, for example, of the impact on racial views in America of the Cosby Show. Today there is none of that. Marketplace fragmentation eliminated both the rationale and frankly the viability of this point. You can’t force people to eat their spinach when they other choices. This has led to what we’ve seen over and over in field after field – the hourglassing of America. You’ve got Wal-Mart at the bottom, Neimans at the top, with everyone in the middle getting crushed. This again reinforced the degree gap, as not only was the economic experience of those with and without bifurcated, there were also increasingly fewer common cultural touchstones. They increasingly inhabited different worlds. I list this under the Digital Age, because clearly technology enabled this to happen. You need the technical capability to bring segmented offerings to bear on the market, and that’s what the Digital Age did. Everyone knows about the tech revolution, but there was a concurrent development that was in many ways equally important. This was the nationalization of business. Think again back to the 1980’s in a mid-sized or small city. Your hometown probably had three or so major locally based, publicly traded banks. Your state probably severely limited their ability to open branches, so the market was highly fragmented. Your town probably had a couple department stores that were either part of local or regional chains. This might have been true of discounters or even fast food restaurants. The local gas and electric companies were locally based. Only Ma Bell pre-1984 was a national utility, and a heavily regulated one. In short, while may industrial businesses were national in scope, there were still a huge number of industries that were incredibly fragmented into local or regional markets. The deregulation of the 80’s and 90’s ended that. The end of restrictive banking laws put us where we are today, with a handful of major nationwide banks like JP Morgan Chase, along with a few odd surviving “super-regionals”. Utilities have been sold off. Department stores merged out of existence, perhaps most poignantly illustrated by the rebranding of Marshall Field’s flagship store in Chicago as Macy’s. Macy’s is truly America’s department store now. Wal-Mart and Target, once regional chains, are now ubiquitous. So too Walgreens, CVS, Home Depot, etc. This also, incidentally, transformed the professional services industry. In 1990 virtually all of these industries were city office based. To be the office managing partner of the biggest office or headquarters city was a huge deal. But in the 90’s, as business changed, and as the level business domain expertise required to integrate technology into business strategies, processes, and organizations became much, much higher, all of these industries restructured into national practices based around industries, with P&L responsibility resting with the industry sector leads. That’s one reason I spent so much time on airplanes in my career. Of course, this disproportionately benefited large cities in the middle of the country with big airports, where you could base lots of people and fly them conveniently around. Two big winners: Chicago and Dallas. With so many businesses now large scale, deregulation continuing in vogue, and a post-Cold War end of history euphoria in the air, the stage was set for future liberalization of international trade regimes. Your local bank or store probably didn’t care much about international markets, but Citigroup and Wal-Mart sure did. Thus the 1990’s saw not just the oft-despised NAFTA, but the far more important Uruguay Round of the General Agreement on Tariffs and Trade that created the open global marketplace as we know it today. The WTO was a creation of this treaty. The digital revolution, nationalization of business, the end of the Cold War, and the resulting trade agreements, set the stage for the Globalization Area. Connectivity. Virtually everyplace is now linked by extensive and reasonably priced communications and transport networks. Increasing international standardization. This includes the global internet, global financial standards and trade rules, the use of English as a global business language, the ubiquity of containerization, etc. Integration of previously closed economies into the global economy. The end of the Cold War meant the end of isolation of the eastern block, as well as the battles over the alignment of other nations. Also, the West made a fateful decision that, unlike during the Cold War, it would extend virtually all international privileges to any nation regardless of whether or not it was a democracy or conformed to basic western notions of the rule of law or human rights. Previously the US may have supported many undemocratic regimes, but it didn’t trade much with them and it didn’t invite them to participate in major international summits like the G-20. The virtualization of business. It’s not just about Japan exporting finished products to the US. It’s not just about moving manufacturing to Mexico. It’s about moving any function anywhere. Get your raw materials from Brazil, put your plant in China, your IT in the Philippines, your IT and HR operations functions in India, your R&D in Switzerland, and your finance in New York. Foreign champion firms. Where once it was only Japan or Europe with major champion industries that could take on American giants, today it is anyone, from South Korea to China to Mexico. One thing that characterizes these firms in many cases is their tight links with their home state government, which actively promotes them and protects them and does everything in its power to advance their interests. It’s not just China, it’s everywhere, though weaker in the Anglosphere. And I think if you look at virtually anyone who has an “oligarch” profile (i.e., a guy who nobody heard of a decade ago who became a billionaire through canny acquisitions), I think you’ll find few of them have records that would stand up to scrutiny. What does this end up doing? I have written before on the forces of globalization. But the underlying consistent themes are mobility and speed. Mobility of production, mobility of service provision, mobility of information, mobility of money, mobility of labor. All of these are mobile, and they move at speeds that would have been considered unthinkable just a short time ago. What does this mean? Well, it means a lot of things. Importantly, as everyone knows, it has meant that previously non-tradeable items are now fully traded in global markets. This has particularly affected white collar work that was previously immune to offshoring, everything from IT to invoice processing to architectural drafting to call centers to HR operations. This has upended the old college degree/high school diploma split. Now, just having a college degree doesn’t save you. You need to have skills and work in a field that is not subject to international labor arbitrage. One could argue that there’s a new economic bifurcation, this one not based on educational attainment, but the tradeability of skills. However, this really hasn’t changed the old split as much as adjusted its proportions. Few of the types of people who lost out in the 80’s and 90’s are faring much better today, but they are now joined in their misery by a new chunk of folks with degrees. In effect, globalization drove a wedge and split the educated into two groups, and threw a good chunk of them into the losers pile. This split within the college degreed between those who benefit from globalization and those who are victimized by it has narrowed the US economic base considerably, and dangerously in my view. I’ll reprise my four facts about Silicon Valley that sum it up: Between 2001 and 2008, the San Jose MSA’s: a) real GDP per capita increased by 20.8% b) total real GDP increased by 25.9%, c) real GDP per job increased by 39.6%, BUT d) total employment declined by 9.4%. That’s America’s problem in a nutshell. Growth without job growth. Growth in economic output without growth in employment. This economy simply doesn’t generate enough jobs to keep Americans employed. Perhaps in the 90’s, we could pretend that by simply getting more people through college, we’d be able to make the transition to a broad based Information Age. But not today. That’s why we had a “lost decade” in the 2000’s, and are facing a gigantic employment problem right now. Even those who are currently prospering in the globalization age would do well to look over their shoulders. In the 90’s, people with college degrees could perhaps be forgiven for thinking that blue collar work was a far away industry of which they knew little. Today we know it’s a case of, they came for the factory worker…..
Back to the notion of tradeability in jobs, what jobs are these that aren’t tradeable? There are basically two kinds of these: occupations requiring face to face interaction or in person service, and those involving specialized skills that can’t be obtained elsewhere. Occupations requiring face to face interaction can include things like school teacher or plumber or primary care physician. But some have argued that the nature of the global economy has created almost by definition a scarcity of face of face communications. To the extent that you can obtain a proprietary advantage through face to face contact, that by itself is worth something. Obtaining this generally depends on the number of people, their particular skills, the ease of interaction, and dense and open social networks. Specialized skills are often niches that are subject to agglomeration economics that are the basis of cluster theory. It’s obvious that both of these work to the advantage of cities. They have more people, more skills, more opportunity for face to face contact, more openness to change and innovation as a general rule, and usually more open social networks. They are usually the places specialized skill clusters are found because you need a certain sized economy to support an ecosystem. (There are important exceptions to this, such as the Warsaw, Indiana orthopedics cluster). That’s one factor driving increasing urbanization on a global scale, and leading to disproportionate economic output in cities to an extent we’ve not seen previously. This suggests that there is some critical mass of size above which you are more likely to be competitively advantaged and below which you are more likely to be in a rough spot. That doesn’t mean every place that’s big has it made, but size certainly matters. There’s great debate on where the line is. I think it is fair to say civic leaders in almost any place would argue they make the cut. I tend to draw the line lower than some, and I believe there are going to be any number of smaller places like Warsaw that do ok by finding a niche, but on the whole, cities of a certain size are where it is going to be. Another thing this notion of specialization suggests is a typology of cities. If we think about specialization, we can think about it along a couple of dimensions. We can think about it in terms of economies that are diversified in many industries vs. those that are concentrated. And we think of an economy has having tradeable industries vs. non-tradeable ones. 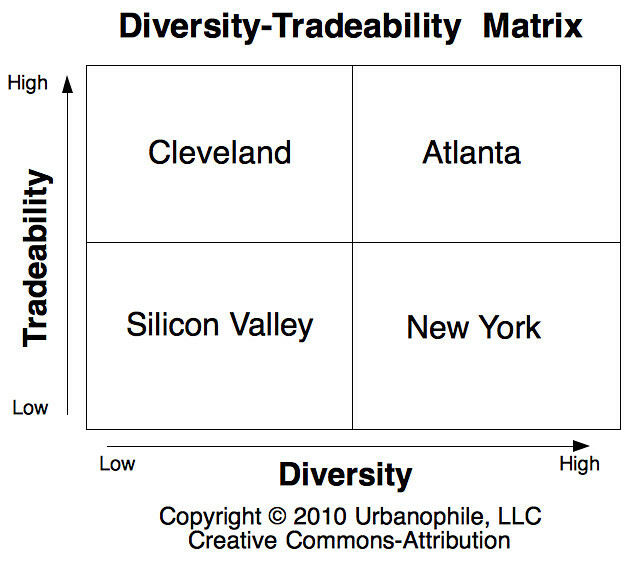 Global cities have a high diversity of industries with generally low tradeability. I wrote in an earlier post that many global cities were in fact the epicenter of some important 21st century macro-industry. But that doesn’t mean that’s all they have. New York is the paradigmatic example. Yes, it is the center of finance, but it is also the center of media, high culture, fashion, advertising, and many other things. In essence, one of the hallmarks of a global city is its diversity of specialties. This is one of the things that contributes to their resilience. 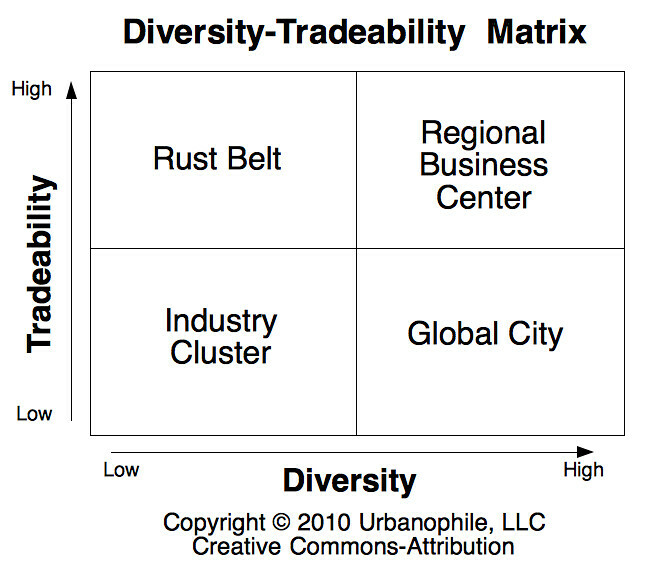 Regional business centers are diverse, but often predominantly feature tradeable industries. Atlanta is a good example here. These may be thriving places to do business in many respects – and there are many of them in America. But in some ways it seems their ability to generate economic value and wealth is eroding. Between 2001 and 2008 (the maximum range available), Atlanta’s GDP per capita actually declined by 6%. Its per capita personal income over that period declined from 109% of the US average to 95%, a stunning 14 percentage point drop that was the worst in the country among metros greater than one million in population. This is just more confirmation of what I said before, that Atlanta is a troubled region. But beyond Atlanta, it calls into question the entire Regional Business Center model. Over that 2001-2008 period, 12 or 13 of the top 15 declining large metros on a PCI vs. US average method are ones I’d classify as Regional Business Center. Most of them have added jobs. Some of them even added a lot of jobs, like #2 Raleigh-Cary. But it seems they have increasingly lower end economies from a wage perspective and potentially a value one. This should be setting off 911 alarm bells. This is where the preponderance of thriving American cities lie. These are America’s bread and butter cities, highly overlapping with what Brookings called “New Heartland” metros. If this model peters out as a success strategy, the results for the US could be catastrophic. A Brookings writer sort of recognized this trend, noting that Atlanta had an income decline for “for reasons I don’t understand.” Well, people should start trying to understand it. Possibly one explanation is that the jobs they are creating, which are most of the new jobs in the country incidentally, are low wage due to their tradeability and thus are pulling down the average. If true, this means their core higher earning functions might be intact, but that America is drifting in a decidedly low wage direction. Whatever the case, we should figure out what’s really going on pronto. Rust Belt cities are those that are concentrated in an industry that proved tradeable, like manufacturing. No surprise, places like Cleveland are hurting big time. Many of these places may no longer be technically concentrated in a legacy industry, but they still act like it. Their institutions, political systems, social structures, business practices and more are still often oriented around a legacy industry. Thus they behave as if they are concentrated even if they aren’t today. Industry cluster cities are concentrated, but in an area that is not tradeable. Silicon Valley is the paradigmatic example here. But places like the aforementioned Warsaw, Indiana also count. It is obvious that if anything happens to the core industry of these cities, either it becomes tradeable or somehow obsolete or out of favor, these towns could be tomorrow’s Rust Belt burg. Where does this take us? If we look at these trends, the future could seem rather bleak. But I prefer to be optimistic even I can’t predict how it will all work out. The endless debates over immigration reform show that America remains the place millions of people want to be. Clearly, people are voting with their feet in favor of the US, and that’s the ultimate endorsement. And if the last three decades have shown us something, it is that change happens fast. Globalization as it is currently practiced might end up proving to be just another decade long wave. In the 1980’s, many predicted Japan would displace the US as the world’s dominant economic power. It never happened. People have been betting on the decline of the US as long as I’ve been alive. But to date betting against the ultimate resiliency of the American republic has proven to be sucker’s bet. Still, one lesson I take is that the forces unleashed in these waves have effects that are long term, and often not obvious. The early 80’s recession wasn’t just a cyclical downturn. It was a signal that manufacturing as we knew it was over. The forces of change unleashed then continue. They’ve finally taken down the auto industry, and perhaps in a short period of time the industrial restructuring will be complete. Similarly, I’ve long drawn a parallel with between the 2000-2002 Rust Belt recession and the 2000-2002 dot com recession. There was a recovery from that, but I believe the signal is clear: technology as a macroindustry may be on the way out. It may take 20-30 years to get there, but I believe traditional tech employment is in long term secular decline. Those flush 90’s IT consultancies employ a lot fewer people than they used to (onshore at least), and probably will only employ fewer in the future. Dittos for corporate IT. While companies like Apple or nimble web startups might continue to thrive, mass IT employment for people without top tier tech or organizational leadership skill is going to suffer. I’m far from the first to suggest this. See also the famous piece, “IT Doesn’t Matter.” I could not in good conscience recommend that anyone in the US coming out of college go into IT today. (In India and elsewhere, it’s a different story). Similarly, there’s no such thing as the “green economy.” Within a decade, there will only be the economy. It will all be green and we’ll be right back to square one. So while I certainly think these sectors are worthy of attention, we ought to be careful about them. Any “next big thing” gets absorbed into the system as it were, and becomes less of an industry in its own right. This means we should be careful about overly betting on specific sectors, particularly when those sectors have increasingly narrow employment bases. We need to be aware of the forces and implications of the global age, recognizing that things will continue to evolve rapidly, but that nevertheless macro forces can transform us over a period of time in ways we don’t pick up from the cyclical ups and downs. The first implication to address is the narrowing of the economic base. The signature problem of our time is to find a sustainable new model of both job growth and growth in jobs that provide a middle class standard of living with a realistic prospect of upward mobility. Without that, without a base belief by the broad public that there is economic security, progress and policy consensus on any other issue will prove illusive. The Great Recession will eventually end. But I’m not sure the secular forces that produced a lost decade will. We can’t let even a recovery lull us to sleep. Going back to the 90’s, we’ve obsessed over how to generate more high skill jobs. Every city has programs around biotech, high tech, etc. I’ve written a lot about this myself. Clearly it is needed. Also, there’s been a lot of fascination with the urban transformation of places like New York or the ultra high value generated by clusters like Silicon Valley. Obviously places look at this and think they’d like to have some of that wealth generation for themselves. The question is, how many cities will succeed at this, and to what degree? Also, how many jobs will this create? Probably not that many. Probably not enough to turn around even an entire metro area, much less the United States. Chicago has had one of America’s great urban core booms, but has hemorrhaged jobs. Right now everyone is focused on foie gras, when what we really need is more meat and potatoes. I think that’s one mindset change that needs to happen. Joel Kotkin believes that the future is “vanilla.” I think there’s something to that. Yes, we need to continue focusing on wealth generating industries and high skill/high paying ones, particularly in places like the Midwest that don’t have many of them. That’s part of how you pay the freight for everything else. But we’ve also got to look at the everyday. Maybe, for example, we should put less focus on splashy downtown showcases and more on basic neighborhood services. Maybe less effort into biotech and more into creating a generally positive business climate for investment. We need better balance in our thinking. We also need to recognize that our economic future is metropolitan, including cities and suburbs. This isn’t just an American thing, it’s a global trend. The notion of the yeoman farmer and the virtues of rural and small town life run deep in America. I grew up in a rural area and very much appreciate its values. I still hold them in many ways. We should respect them to be sure. But they aren’t our economic future. The future is in city regions with the minimum scale to compete. Our policies need to recognize that. You can be sure that other nations are very clear on this point. As part of this we need to think about the new urban typology and how to make it work. I put one here, but there are many other ways to look at it, such as Brookings’ new take. Clearly, in a diverse America with diverse cities, one clear imperative is a diversity of strategies and policies to match. We need to think a lot less like a platoon of foot soldiers marching in unison and a lot more like a sports team where everyone has their own role to play. I think the most important thing is to figure out how to make the Regional Business Center model work, and migrate more cities from the Rust Belt category into it. This won’t be easy. They’ve got the tough challenge of boosting incomes and maintaining job growth. Their low costs are an advantage, but a race to the bottom is a suckers bet. Much of the thinking about cities has been about America’s traditional urban centers. These places are simply too unique and impossible to replicate to serve as models. The “superstar cities” of America have an important role to play in our national economy as high value production centers. They really are foie gras, but they’ll never be the main course. We need to cultivate quality, prosperous workaday cities for the bulk of Americans to live and work. This means accepting that they are a very different animal from the tier ones. Lastly, we need to forge a new framework for an American commonwealth. The great mass market is gone. Almost everything is fragmented today. The era where a one size fits all policy like the interstate highway system creates consensus is fading. Our nation is simply more diverse than ever on almost any metric. There are more versions of the American Dream than ever. We’ve got to find a way to make that work for us so that we can move forward. Lucky our federal system and tradition of local control give us the tools to do this. But it won’t be easy. Part of it I think will have to involve a more live and let live approach where we accept that other people simply have different values and preferences from us, that our desires and beliefs, no matter how deeply held, are largely not moral universals. I can’t predict exactly where we’ll land. But America has long proven highly resilient and able to continually reinvent itself. It’s our great strength. I can’t say for sure how we’ll do it this time. But I believe it’s more likely than not that we will. We’ll know we’ve done it when we have an economic system that provides reasonable economic security and upward mobility prospects for the middle class, and in which a rising tide starts lifting most boats again. * I didn’t do a quantitative analysis to map these cities, but it would be interesting to do one and see if the conceptual model holds up. And yes, I prefer to spell “tradeability” this way. “Eight metros suffered drops of more than 100,000 private-sector jobs during the same 10-year span, with Detroit taking the worst hit, losing 498,300 positions since May 2000. FWIW … Pittsburgh didn’t fare to well, either. That list is even more interesting if you look at the percent change in jobs. The point being that we are about to start a decade that will see a lot of new winners and losers in the urban hierarchy game. Remarkably, the transformation has gone largely unnoticed. Only now are we coming to terms with what happened in the 1990s, which is the lens we are using to forecast the 2010s as if this deep recession wouldn’t shake up the order of things. I see the advice to go into a non-tradable occupation all over the place, but I do not understand it. Presumably, you and all your neighbors will buy tradable goods and services. Your money will flow to wherever those were produced. If you all work in non-tradable services, your only market is each other. No money flows in. Your productivity would have to grow at an explosive rate to sustain that. Don’t at least some people in your metro area have to be champions who go out into the competitive tradable markets and bring home some treasure? Anon, I would distinguish between whether the good or service being provided is tradeable/exportable vs. whether the job itself is. I am also concerned about the massive 6 digit job losses you’ve quoted. But this begs the question–is there a major city in America with a more mature, developed economy that hasn’t been losing jobs? Washington DC comes to mind, although I’d hardly call it a ‘mature’ economy. All of the news is about the boom in Texas, but how do we interpret these trends? Is it really accurate to say “Texas is winning, everybody else is losing” when one looks at this data, or do we need to step back, WAY back, and look at the really big picture here? Obviously we can’t travel to the future, but lets ask ourselves, “what is fueling Texas’ job growth boom?” and is it something that will really last, say, another half century or more? What factors will eventually affect Texas’ long term performance, economically? Aaron, which metro areas would you classify as regional job centers? Atlanta is an obvious one, and so is Dallas, but beyond that it’s a little more arguable. For example, is San Diego a regional business center or an industry cluster? But regardless, it’s a good way to visualize those regions, yes. I think it’s a really good insight about which types of regional economies did a-okay in the 2000s and which fell behind. The title to this post, “A Better Tomorrow,” is so laden with irony that it would put a hipster on cloud nine. This is more of a journalist writing an obituary while the subject is alive. The subject here: the United States. The implications read more like a morbidly obese person so immobilized by girth that they are bound to their bed, all the while their bodies are going into failure mode. “The New Bifurcation” means the bottom has fallen out of opportunities to gain wealth. Technology and globalization has now made labor a virtually perfect commodity (in other words, the only differentiation will be low price). At the same time, seeking a safe harbor through capital accumulation debases the value of rents because more people are able to invest. (Jesse Livermore’s axiom: The most successful market rallies take on the fewest traders). “The Narrowing of the Economic Base” and “A Metropolitan Future” both indicate the American future is one of consolidation. In the business world, the only parties that experience growth through consolidation are all in the FIRE sector, since they are fixing the transaction. An industry or sector consolidation is a signal of decline. The same goes for places we live. This is a sign that here on out, we are more likely going to see growth flee to the safety of established centers rather than the sprouting of new city regions. This is a feature and problem in Europe where primate cities are tasked with carrying the burden of an entire nation’s economic activity. These all point to a nation overall in decline, and maybe the Midwest Rust Belt cities have a perverse advantage in that they witnessed the dress rehearsal firsthand, and now the stage is set for all 50 states. Since I set a gloomy picture in Post 6, I’ve been thinking of yet another game-changing shift the U.S. may likely face. Let me preface this that it’s only a gut feeling, not something that’s been meticulously researched or calculated to give probabilities of when it will happen or in how much of a number whether it does. I’m just saying this to provoke a discussion (and to be labeled a kook 🙂 ). Economics, geography and technology have conspired in ways that make the landscape of civilization look like one of those rope-and-plank bridges in the Indiana Jones movies that collapse as we cross them. Aaron mentioned the major economic shifts that occurred in the last two generations. Second was the electronics revolution (machinery, software, communications). Third was globalization (the intersection of information, communication and finance on a worldwide sphere). These three made stage four possible: Outsourcing, or moving labor closer to a perfect commodity. Now, all goods and services can be had at the lowest possible price. So what’s stage five going to be? Insourcing. We’re still struggling to cope with outsourcing, or knowing that jobs we once did disappeared to places we can’t see. Insourcing means that we will now see the people and processes that make us obsolete where we can see it. In other words, insourcing will transfer commodity labor into established pools of capital. Wad, I think you’re misusing the word insourcing. Usually it means doing things in-house instead of outsourcing them to another company (which, note, is not the same as offshoring). It can be a substantial cost saver, especially in a recession, and allows the company more control over things. Massive offshoring only began after the first world’s economic growth created a huge gap between first-world and third-world salaries, making the wage savings larger than the loss in efficiency. I don’t read Aaron’s post as as pessimistic as you do. It follows a theme of “Things were good, they’ve gotten worse, and they’ll get better.” More importantly, it tries to figure out which areas have declined and which haven’t, to try and get a future trend. It’s not the same as the Inmydayism of people like David Simon or latter-day Jane Jacobs, which posits that all growth regions are a mirage. Alon, glad you liked it. San Diego is an interesting case. I don’t know a lot about its economy. It’s a biotech center, but that might not mean much overall. It has been growing jobs, which is something places like Silicon Valley can’t say. Clearly, there are other ways to look at this. Jim Russell uses his “brownfield” vs. “greenfield” view, which I think has great merit. Perhaps rather than diversity of employment, we could see that as the differentiator between RBC and Rust Belt. I would suspect that many of these Rust Belt places are in fact diverse economically today, but their business practices, infrastructure, regulatory environment, etc. are oriented around their legacy cluster (e.g., Detroit or Cleveland). I should also note that my global city definition wouldn’t foot to Sassen’s or others, which are more based on financial and producers services exported as specialized functions particular to the globalized economy. It really seems to me that there are three main types of places: places that are generating lots of new value but few if any jobs (or actually destroying them), places that are generating jobs but lower end ones as evidenced by eroding % of US PCI and flat to declining GDP per capita, and places that just plain doing bad. (I scanned PCI gainers for ones that to the eyeball appeared to be gaining material new jobs. It’s a short list: Oklahoma City, San Diego, Washington DC. A better analysis should be done of this matrix). Wad, nobody is very going to accuse me of being a great headline writer. It’s one of my worst skills. I actually gyrated through several before picking that one. Incidentally, “A Better Tomorrow” is the title of John Woo’s first “heroic bloodshed” film. It didn’t exactly have a happy ending. I actually don’t think the US is dead yet. If you look at the short term trends, they are very bad. But there’s always big risk in extrapolating things forward. Something is going to change. Probably a lot of somethings. I think the US will pull through ok, ultimately. But clearly we can’t go back to the status quo ante. There will be changes. I’m just looking to explore where some of them might need to be. I find the “industry cluster” category interesting. Can you think of another region beyond the Silicon Valley that qualifies as such? One can say the the industry clusters of today are the rust belts of tommorrow. Detroit was certainly once an industry cluster. So was Pittsburgh. In a sense, so is Las Vegas. The technology expertise that has made the Silicon Valley famous could eventually be outsourced to India or China. TUP, I think most of the “industry cluster” centers are probably one-industry towns like Warsaw, not large cities, which are generally fairly diverse. Silicon Valley is the best example. Washington, DC is arguably another. Potentially you could consider Portland an industry cluster city where “lifestyle” is the industry. Potentially some of the energy-heavy Great Plains cities like Oklahoma City might count. I’d have to look harder at them, however. The coal- and oil-dominated cities are all good examples of industry clusters. OKC is one, but an even more extreme example is Casper, Wyoming, whose low-sulfur coal deposits have made it one of the richest regions in the US, now that sulfur emissions are controlled and carbon emissions are not. Calgary and Edmonton are industry clusters, too, but they’re less extreme. However, Houston is not, as it has a large manufacturing base, including high value-added manufacturing related to aerospace; it’s a global city instead. One of the most interesting things I heard this year was in Fort Collins, where I heard about the enormous market for an energy saving device on Caterpillar engines and the like. The point was that there is a big market for “green, clean high tech” in mundane things like tractor equipment. Other than inventing an entirely game-changing technology like an iPad, it’s difficult to come up with something entirely new. And what is “high tech” and “clean tech”, after all, except newer, better ways of doing traditional tasks? The people in Fargo are going to know a lot more about agriculture than the people in San Jose. The people in San Jose are going to know a whole lot more about computer networks than the people in Fargo. They should each stick to their knitting, and make marginal improvements in the things they know. I believe there are an almost infinite number of “industry clusters” out there, if you redefine these as “niches”. That’s old business school-speak for specialties. Just as Penney’s went after budget clothing for women and children, towns and places can specialize in market niches. A market niche is really nothing more than a customer you know really, really well, and a set of problems or challenges you already have familiarity solving. We all do this in our work, to a greater or lesser extent. We have an industry we work in, and a set of skills we bring to it. Agriculture and manufacturing, two things the Midwest has traditionally been strong at, are not necessarily going away, although the shrinkage in the industrial base means that the Midwest is getting a whole lot less practice solving manufacturing problems. But I wouldn’t give up on it, simply finding the remaining business and get even better at solving its problems. In many ways, one of the best histories of the last 50 years is David Halberstam’s “The Reckoning”, written in the mid 1980s about the decline of Ford and the rise of Nissan. It’s really a much larger history, about the decline of post-war manufacturing, and the real story there is how management and unions colluded to pass on badly-made products and got sloppy in keeping products top notch. My take-away from that book was the need for continuous improvement. Today our economy is down so far that we have to work enormously hard simply to get back to where we were, relative to other countries, as technology leaders. But don’t discount the generations of skill we have built up here, and the strength of our communication and distribution and financing and legal systems. We do have a have a complete business system here, which is more than much of the world, including both India and China have. We have a fundamentally honest legal system, and that is not to be sniffed at. What we’ve lost is the dominance of market share that, like GM, gave us economies of scale and yet also allowed us to get sloppy. Now, like Canada and Denmark, we have to become very good at dominating niches, and learn how to sell our products to the rest of the world again. Alon, I guess I misused the words “insourcing”, “outsourcing” and “offshoring”. My theory would not be clear. In other words, rather than the current trend of wealthy nations exporting low-value work to developing nations, the developing nations will resettle their low-wage workers in the wealthy country to perform their work. This is distinct from migration waves, which are informal individual or community decisions to seek opportunities elsewhere. This new economic order will be formalized, coordinated and enforced by laws and treaties. It’s almost colonialism in reverse. Picture this scenario: The Great Lakes Rust Belt, for decades spiraling into a population oblivion, suddenly reverses course. Abandoned factories have been reactivated, modernized and meet the state of the art in cost-, energy- and eco-efficiency. Goods that the U.S. stopped making for domestic consumption and exports are once again made in the factories, running at or near capacity, that once made the area an industrial dynamo. Housing left to rot has now been rehabilitated or torn down and replaced with better-quality construction. Depopulation has turned to repopulation. The Rust Belt roars back to life. There is one detail that was left out. The busy factories, the replenished housing, the rejuvenated cities? They do not incorporate a single American in any of them. China crafts an economic deal, one based upon similar deals with supply regions in Africa, Latin America and other impoverished nations (this part is happening right now), with the appropriate federal, state and local governments. China offers a down payment to the U.S. as well as investment in the form of purchases on the following conditions: It wants not only the guaranteed rights of ownership conferred on all U.S. property holders, but also the discretion to use any powers in its means to replicate the conditions necessary for its economic success without local action or interference. The various governments are bitterly divided, but in the end money talks and the politicians swallow their pride and sign off on th pact. China will now own portions of the Rust Belt, possibly a large segment of cities. China arranges for the transfer and resettlement of residents of a city it has targeted for industrial development into this Rust Belt locale. They will produce a “Made in China” good in the USA by Chinese nationals working at Chinese prevailing wages under the same laws governing them in China — except this is in Michigan, Indiana or Ohio. The American citizens will witness this activity but not benefit from it or even see it, as this prosperity zone will be inside a walled garrison. “Good fences make good neighbors” is a global adage, as the outside walls protect the prodigious Chinese from American reprisals and the inside walls remind the Chinese that they are thousands of miles away but never really left home. There are real-world trends that are pushing trends in this frightening direction. One is China and other capital-enriched nations (Korea, Japan, Middle Eastern oil producers) making resource plays in poor supplier nations that include outright ownership and human resettlement. The global financial infrastructure as we know it has been delegitimized. The crises in finance capitalism are manifold, and new problems pop up like wildfire hotspots. Governments and central banks will add to the troubles through currency gimmickry. This will go on before all actors realize that investment behavior will become too erratic to be viable, and that the spread between speculative expectation value and tangible value has become too wide to ever reconcile. Solution: The only remedy left will be claim and physical possession of tangible assets. Problem: Developing countries would be economically isolated and collapse if cut off from capital access. However, the developing countries that develop a comparative advantage in this scenario are nations like the Philippines, Mexico, India and Lebanon, all of which have developed a cycle of promoting talent emigration and remittance-based economies. They’ve spent generations developing a semi-formal social system of resettlement and transnational bonds, so they have the experience. Solution: These emigrate-and-remit nations have worked outside the official multinational channels and could now be better positioned economically to formalize this informal system. Problem: There are several models anticipating ecologically driven mass resettlement. The U.S. had one in 2005 with Hurricane Katrina. Some climate change models show coastal areas or islands under water by century’s end. The “Green Revolution” in food production has the unfortunate side effect of accelerating desertification. There will also be economic resettlement from resource exhaustion, as mining and fishing areas cease to be viable. Then of course, we have the most ominous of them all, Peak Fossil Fuel. Solution: Mass resettlement is bound to happen, but it shouldn’t be taken for granted that it will all be to supply regions. There are development economists that know it’s better to be higher in the economic-value chain. These are some of the factors that will push for the transplantation of developing cities resuming and maintaining their functions in the developing world. I’ll say it, it will never happen. Not like that anyway. You’re missing the distinction between the deals China may be making with resource supply nations and our region. Oil and gas deposits can’t be moved. Their presence defines where the Chinese workers need to be. Why would the Chinese or Indians’ want to be in outdated, crumbling 100 year old factories? To save a few cents per item on shipping? The Midwest is still a manufacturing center because of its human capital. That flows in the other direction. A US manufacturing company sends its best employees over to China to train Chinese workers at a “partner” facility. 18 months later, they close the plant in Ohio. The US company continues only as a marketing function. This has been going on for years. Contrast this to the housing bubble in the same years that millions of Mexicans entering the US illegally. We haven’t figured out how to import houses yet, so we did the closest thing. The location of the construction sites dictated where the migrants had to be. Construction companies preferred *illegal* migrants becuase they weren’t bound by minimum wage laws, safety regulations, tax liabilities, legal liabilities, etc. Im not sure how much value there is to me asking about this, but you did not touch much upon the distribution of wealth. I have a feeling, and its probably out there, that if we looked at the data we would see a disproportionate amount of money in the hands of fewer people. I have my own experience to draw on, but work for a large “global” automotive supplier. I have seen our drafting department outsourced to India. Our help desk disolved only to be outsourced to who knows where and a single person on site to serve over 300 in a building. A wave of layoffs over the recent recession while work output went up considerably. When you think about the people making the decisions, these decisions are made by a handful of individuals all making 6 figures (or more counting bonus) and affecting a large amount of middle to upper middle class workers. In an A to B equation, what does this mean? Those high paying people got to keep their jobs, forecasts stayed where the board said it would, but effectively, a large swatch of skilled, college educated and tax paying citizens are now out of jobs left to look for likely lower paying jobs. If they are lucky, they can find a still domestic contract shop looking to take on their services but likely at a lower wage while someone in India makes pennies doing the same thing and there is an ant-hill of people waiting to get them. Where does this end? At the macro level, Im sure this is going on EVERYWHERE across America in the increasingly global market. If you have a job, then it’s great. But this requires a lot of work to make sure you can diversify your skills and remain flexible. This could even mean moving where the jobs go which also touches on the social implications of such an environment… but that is not worth expounding on at the moment. I simply wonder when this trend will stop; if ever and how us currently decently paid employees will be able to predict the next trend to diversify with, so that we can remain decently paid. Aaron, I didn’t mean to bust on your headline writing. In fact, as you’d learn in journalism, headline writing is often one of the most difficult tasks for copy editors. Titles or taglines in marketing sessions are tougher still. Imagining sunshine must be the last hope for those living in a dark age. Aaron, San Diego is a very interesting case. The San Diego region (the city and the suburbs within the county) has been fueled by both wealth-generating and poverty-generating industries. San Diego’s wealth-generating industries include biotechnology, communications technology (centered around Qualcomm), defense engineering and research & development. These high-value industries are putting upward pressure on the cost of living. That’s bad news for San Diego’s poverty-generating sector. This sector includes tourism, agriculture (San Diego has an agricultural hinterland in the east county stretching into Imperial County), unskilled and semi-skilled services and the military support sector. This sector is labor-intensive and produces many low-wage jobs that offer limited wealth generation and mobility. There are also two other factors pushing the poverty rate unusually high: the military and the border economy. San Diego is home to the Marines’ Camp Pendleton, its western basic training base, and an air station, as well as the Navy’s Pacific Fleet and its own air station. As a border city, San Diego shares close ties with Tijuana, Mexico. It shares a two-way bond, where Tijuana was until recent years thrived on tourism and, how should I say it, “military support”. 🙂 Tijuana’s contribution is tens of thousands of Mexican nationals working in San Diego. Distinct from immigrants, these are Tijuana residents working in San Diego and commuting across the border daily. San Diego somehow manages to attract these sectors without one crowding out the other. The cost of living hasn’t made its low-wage sector uncompetitive, though that may largely be due to the Mexican workers. The low-wage cluster, which developed and matured first, hasn’t repelled the high-value cluster. Plus, the military is staying in San Diego for strategic value even though the local economy is no longer dependent on its presence. The question marks for the Phoenix metro area’s decline are pretty funny for a grim situation. Phoenix wouldn’t fit well on the quadrant matrix. Phoenix is the equivalent of a momo stock. It’s growth was driven purely by growth itself (momentum). Phoenix just didn’t leverage the momentum into something lasting, and its economy was built around getting more people to move there. Its leading industry became mortgages, financing and construction. Phoenix has sort of a C-shaped arc with parts of its economy in the RBC, Rust Belt and Industry Cluster categories. The only global city-level presence it would have is from the metals mining headquarters (Freeport McMoran and Southern Copper, to name two). Otherwise, many of its jobs are highly diverse but also highly tradeable; Phoenix’s strategy for jobs development has long relied on poaching California, New York and Chicagoland. The Rust Belt appellation comes in due to the housing-centered momentum economy, even though its population has not stopped increasing. The post-bubble aftermath certainly looks like the slow wasting of Rust Belt communities, but without a retreat in growth. Perhaps it could be called the Drywall Belt. As for San Diego’s place in the quadrant, it too would have an unusual shape where it fits in multiple categories. San Diego would have a “candy cane” shape with much of the length in Industry Cluster, the smallest part where the length turns to the crook in Global City, and most of the crook in Regional Business Center. This is an excellent, and detailed post, Aaron. The only concern I might express in response is the issue of “responsive” versus “creative” city economies. One of the major challenges I see in cities you describe as low in tradeability and low in diversity is not their economic stats. It’s the fact that they’re in a position of trying to respond to a changing world economy rather than helping to shape it. This–to me–transcends most considerations about unemployment rate and per capita GDP that are held dear by urban economists. I notice, in the larger planning conversation, that there’s no shortage of recommendations for cities like Detroit and Cleveland. “Deregulate trade, lower taxes, make the environment more pro-business, like Dallas,” says one. “Build a mass transit infrastructure that attracts the ‘Creative Class,’ like Portland,” answers another. I feel like that’s a more problematic indicator than is an unemployment rate or job tradeablility. A city looking for a answers is also, obviously, a city struggling to keep up. While people may disagree with the policies of a city like, say, San Francisco, few are offering it recommendations on how to turn things around. Perhaps a theorist like Joel Kotkin often mocks San Francisco for its tradition of operating outside the mainstream of capitalism. Matt, thanks. There’s definitely something to what you say. But if I interpret your comment correctly, you are sort of asserting two contradictory things. One is that some cities (San Francisco) have benefited from structural economic changes while others (Detroit) have suffered. Two is that some cities are shaping their own economic futures, but others are not. I agree it is best to play offense, not defense. But are you saying that a place like San Francisco is creating its future, or merely riding a wave of change that is benefiting it? I have said before that global cities are an artifact of the global economy. The global economy needed them, so like the old industrial power houses, it brought them into being. Thus I believe these cities are more the recipients of good fortunes than I do that they all suddenly implemented great policies that turned them around all right at the same time. Aaron, I’m glad you reposted this post. It was excellent and thought provoking. I agree with you that we need more “meat and potatoes” and less “foie gras”. There are only so many biotech jobs and everyone is chasing that. I used to think that cities should look for opportunities in new technology that others weren’t chasing like Pittsburgh could do with robotics since it has a foundation like no one else with CMU. Now I convinced it would be a bad idea since every other city would catch wind of it and we would have the same situation where every city chasing after the elusive biotech jobs. I also agree that the green economy is simply the economy. Sure there are some great green ideas out there but there’s limits. A while back I met this guy talking about what a great boon more efficient (green) appliances would be. As I told him there’s limits to what can be done. It’s the same with green jobs plus there’s the added problem that many green jobs will not be net new jobs. Instead they will be replacing other jobs (i.e. coal miners in West Virginia). This isn’t to say it shouldn’t be done but we must look at the reality of the situation. I don’t really have any answers to this dilemma. All the new industries in the world aren’t going to mean a thing unless they can generate jobs. Other than having a better business climate (the mean and potatoes or vanilla) I can’t see anything else that can be done. I suppose you get all the comments emailed, so I’ll post this here, although it could go in several other threads. I think one of the real problems for the future of urbanism, especially urban areas with legacy disamenities and costs, is that very few economic activities need to be in urban areas. Look at the economies of the post-urban cities such as Dallas, Houston, and Pheonix. Anything they are doing successfully evidently doesn’t require an urban core. Does our high tech future need to be in a city? San Jose is a suburb. Rt 128 is a highway. Microsoft is in a suburb. The Research Triangle is a forest! Towns like Ann Arbor, Ithaca, Princeton, and Rochester MN show that education, research, and health care can all be done at a high level without a city. The fact that most research and development happens in urban areas is due to path-dependence, not agglomeration economies. If you dig through the numbers (you can do this, or I’ll try it someday), I think you’ll find that all the “sucessful” core revitalizations (dense, highly educated populations, 24-hr street life) in the Midwest/Northeast were driven by the finance industry. Its a who-you-know-not-what-you-know business, so proximity matters. Including finance industry revenues, profits and wages in any estimate of agglomeration will overstate the importance of density. Frequent face-to-face contant matters in all industries, but nowhere near as much as in finance. Milwaukee, Cincinnati, Cleveland, Pittsburgh, etc. are not going to develop large finance industries. In the CBD we’re left with local government, entertainment, legacy corporate headquarters, and (possibly larger-than-needed) business support services (attorneys, accountants, consultants, printers). Even with our best-case scenarios of developing new economic activity, none of it really needs to be in the city. What’s left to link economic growth to urban areas? Just entertainment? Consumption of an urban experience? Will that be enough? Rust Belt urban economic geography is a lot more complex than you realize. For example, Pittsburgh has a considerable footprint in finance. I’d bet other shrinking cities sport some surprising legacies. My experience is that most people misunderstand what is happening in the Rust Belt. It’s a different kind of redevelopment. The key advantage is being able to locate R&D as well as production right in the core. Innovation is proximity dependent. Packing these knowledge workers in the urban core generates a tremendous advantage. Someone involved in robotics can mingle with another person designing game technology at a coffee shop where the funding agents also hang. I’ve seen these synergies firsthand in Pittsburgh. You don’t see much of this kind of cross fertilization of ideas in the suburban or small city settings. Instead, you see niche industry density. I see Rust Belt cities as the frontier of innovation geography. Innovation might be proximity dependent on the MSA level, but it is not on the neighborhood or block level. The coffee shop start-up is an urbanist’s dream that happens so rarely, it is economically irrelevant. The empirical “proof” given is flawed. Pick a dependent variable – start-ups, high tech job growth, wage growth, revenue growth – whatever you like. Exclude all the measures of casino finance – traders, hedge funds – while keeping venture capital. Put in a measure of pedestrian level density – degree holders per square mile, number of coffee shops, bike lane miles, etc. Include a few control variables, and you will never find a statistically significant relationship between your measure of urbanicity and your measure of economic development. Most of the activity is in entirely auto-dependent places like San Jose, Austin, Atlanta, Northern Virginia, etc., etc. It happens in these low-density places because it does not require a city. Anon, most Rust Belt cores aren’t that dense today anyway. Here’s what I would say. Urban cores clearly can’t compete against the suburbs. It’s a hopeless battle. But there are people who prefer urban environments, and not all of them are able to or want to live in NYC or Chicago. If you can create a decent urban environment, perhaps you can cater to them. The question is how many of them there are, whether there are enough to go around, and if you can create an environment to capture them. I’d like to read the research that supports your contention that innovation isn’t proximity dependent at the neighborhood or block level. And just because a place is auto-dependent or in the sticks doesn’t mean it is “low-density”. The geography of knowledge spillovers is fairly well established. Silicon Valley is the poster child for the density required. It may not require a city, but it does require density that results from all the proximity demands. We too often confuse residential density and job density. The innovation boomtowns have superb job density. Aaron, San Diego is a military town in wartime. The Navy and Marines have significant operations there, as do many defense contractors. OKC metro is the home of Tinker AFB, the state capital, and the major state university & med center in addition to Devon and Chesapeake, two major natural gas producers. (Its downtown is starting to look a lot like Indianapolis, with a AAA baseball stadium, a basketball arena and a canal district.) Not far away is Lawton, home of Ft. Sill (the Army’s artillery school). I do not think it is any coincidence that the three cities you cited have done well. The decade’s growth industries have included eds-meds, government, war, and natural gas/energy exploration. OKC has all four as drivers. What Rust Belt cities have to offer is non-auto dependent commercial and residential neighborhoods. Like many readers of this blog, I’m in a city with hundreds of thousands of sq ft of empty office space downtown. I’m thinking about how to get job density there. The CBD is surrounded by walkable neighborhoods that are 15 to 50% vacant. I’m very concerned about maintaining residential density, as the vacancies quickly turn to blight. My argument is that if growing firms can create density sufficient for their needs in the sticks, then they don’t *need* the density we have to offer. Which leaves us with an amenities-only strategy. What else do we have to offer? The research I described above has probably never been done because academics don’t set out to find null results. There is little interest in publishing them. I think what’s important to take away from that is that sometimes there’s too heavy a focus on how a city must “adapt” to fit global economic needs, and less on how the global economy must adapt to fit a city’s needs. I offer the Bay Area example because it’s an especially stark version of this–the culture there has been openly hostile to the “global economy as we know it” for decades–but the same is probably true of Charlotte, Houston, Los Angeles, or any other successful metro. Innovations, ideas, and cultures fostered in these cities keep them from being left behind in the global economy because they’re actively changing the global economy to fit their needs, and not the other way around. In this way, yes, they ride a global economic wave that happens to benefit them. But they also play an active role in creating that wave (usually for cultural reasons), and we’d do well to remember that too. I better appreciate the strength of your argument. All density spillovers being equal, why locate in the urban core? One biggie is that there are only so many Stanfords to go around. In Silicon Valley, the nearer to Sand Hill Road the better. A firm pays a dear price for the privilege, which is the fundamental fact of urban economic geography. Some Rust Belt cities have the highest job densities in the country. Others have the lowest. There is a huge variance. I suggest starting with that discrepancy. Residential densities are a red herring. Anon: okay, I’ll bite. New York actually has considerable high-tech in Manhattan. It has the third highest number of high-tech jobs of US regions, after the Bay Area and Washington-Baltimore. The other industries New York is strong in – media, publishing, education – are mostly in the city as well. Finance still dominates the region, but there’s a lot of other employment around, most of which is not in the edge cities. Princeton and Ithaca may have education without real cities around them, but their universities aren’t very large. Columbia has the same enrollment as both combined, NYU has twice the enrollment of Columbia, and CUNY has ten times the enrollment of NYU. We’re not talking about the same scale of activity here. On top of it, Princeton and Cornell, may do a lot of prestigious research, but the most prestigious field is medical science, and Princeton has no medical school and Cornell places its in New York. All of that activity would have left, and NY would have continued its descent if not for finance. The same is true for Chicago, Boston, and possibly San Francisco. The core revitalizations were possible becuase of lots of public spending. The public spending was possible because of the finance tax base. The rehabbing and new development was possible because of finance salaries + bonuses. Your relative size argument doesn’t counter my points. Sure, there are large urban schools. Their being in the city doesn’t prove that activity needs to be in the city. Its just a hang over from the industrial era when industry needed to be in the city, so some schools were endowed nearby. There are also hundreds of thousands of people attending goods schools and doing research in non-urban areas. This demonstrates that these activities don’t require a city. So an activity we would like to attract does not have a need for the built environment we are inviting it to. The participants might or might not have a want for it. We’ve already determined that your comments about low-density environments are bogus. You don’t have any proof to back up your claims about the scale of innovation geography. As for your retort to Alon, it did little to advance your case. The legacy institutions can be leveraged to promote core redevelopment. Why they are there in the first place is irrelevant. Lucky are the states that have their flagship universities in an urban environment. Lucky are the cities that have major research universities in or close to downtown. Those are assets to be valued, not bitterly dismissed. Proximity and density matter a great deal to innovation. Some cities can and have made this exact pitch and benefited from the effort. There’s ample research evaluating such initiatives. Incubator as downtown anchor isn’t exactly a novel concept. Some Rust Belt cities seem to have figured this out (e.g. Brookings “Skilled Anchors”). Others, such as Cleveland, seem content to lament their misfortune. Urban economic geography has passed them by. That’s a load of crap. We find that: i) Geographic space matters even after conditioning on horizontal and technological spillovers; ii) Technological proximity matters; iii) Product—market proximity is less important; iv) Locations of researchers are more important than headquarters but both have explanatory power; and v) Geographic markets are very local.